I've mentioned in the past that Doctor Who has a somewhat volatile, bordering on manic depressive attitude towards its own tone. Since the show has such a broad canvas - i.e. the entirety of space and time - it can weave sharply between tone, style and genre without ever losing its identity: As long as The Doctor is in it, pretty much everything else can change. In keeping with this idea, the show shifts from the silliness of "Dinosaurs on a Spaceship" to the altogether more serious tone of "A Town Called Mercy" with a whiplash-inducing suddenness. Not that you would be able to tell from the opening few minutes of the episode, which initially suggest that this is going to be a typically exuberant, slightly daft genre exercise in keeping with its immediate predecessor. 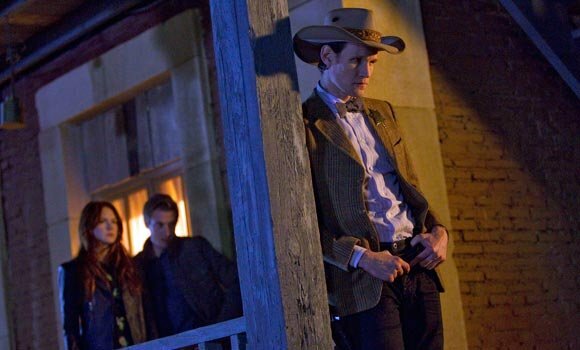 The Doctor, Amy and Rory show up in the Old West town of Mercy circa 1870, and right from the off things seem a bit weird. Setting aside that the town looks like the setting for every Western ever made, it's surrounded by an almost ritualistic barrier of sticks and stones, has a big KEEP OUT sign on its main road (though The Doctor considers such orders to be mere suggestions) and the town has electric lighting ten years earlier than should be possible. Oh, and there's a cyborg cowboy who has been terrorising the town as it searches for an alien doctor, and one just happened to stroll into town. From that set-up, it seems like "A Town Called Mercy" is going to be a fairly straightforward episode riffing on Western motifs (or songs by The Jam), and it is for the first third. In addition to the town itself, which seems to distil every Western with a big "W" image ever committed to film, there is a scene in which The Doctor walks into a saloon, only for the music to suddenly stop, the music deliberately mimics the bold strings of Western scores, and there's even a noble, pragmatic Marshal in the form of Isaac (played by Ben Browder of Farscape fame). Yet the script by veteran Who writer and Being Human creator Toby Whithouse is a lot trickier than that, and one of the delights of the episode is seeing the ways in which it sets things up to look one way, then suddenly flips everything on its head. This starts from the pre-credits scene, which finds The Gunslinger (Andrew Brooke) chasing down a mysterious figure who he promptly kills, though not before asking him where he can find The Doctor. So, he must have some gripe with The Doctor that can only be resolved violently? Well, no. He's looking for a Doctor, but not The Doctor. Specifically, Kahler Jex (played by Adrian Scarsborough, a terrific British film and television actor who I always remember for his role as Mr. Jelly - sorry, Mr. Jolly - in Psychoville), a doctor and member of the Kahler race who crashed landed outside of Mercy some years earlier. Unable to repair his ship, he was taken in and served as the town's physician, in the process saving the lives of everyone in town by combating a cholera outbreak. He's been hiding in the town ever since, an arrangement which has led to tension between some of the townspeople who think that they should sacrifice Jex so that The Gunslinger will leave them alone, and Isaac, who firmly believes that America is "a land of second chances", and that whatever Jex may have done in the past to warrant being pursued by The Gunslinger, it is his subsequent actions that matter most. So, The Gunslinger is an unfeeling killing machine bent on destruction, and Jex is the victim? Again, no. As we learn when The Gunslinger targets Rory at one point, he won't fire if there is a chance that an innocent will be hurt, and he is only driven to threaten the general populace when they refuse to release Jex. And Jex is not an innocent in this, but a Mengele-esque doctor who experimented on members of his own race to create cyborgs like The Gunslinger in order to triumph in a vicious war. Such is The Doctor's dilemma: he must choose between allowing Jex to be killed, or risk the townspeople getting hurt by trying to protect him. The central conflict that drives the episode then becomes one between the moral absolutism of The Gunslinger, who believes that Jex can only pay for his crimes by dying, and the more pragmatic and relativistic ideas of Isaac (and, after he is killed protecting Jex, Amy, who convinces The Doctor that letting violence solve a problem caused by violence is the wrong course of action). In a scene that mirrors countless Westerns, though it reminded me specifically of Howard Hawks' sublime Rio Bravo, The Doctor is forced to hold Jex in a jail cell as the townspeople come to try to take him away. The whole situation is a lot more complex than most episodes of Doctor Who, especially when we consider that The Doctor was willing to let Solomon die in the previous episode, and it was interesting seeing the show tackle ideas of justice, moral debt and the past, best underlined by Jex's description of his race's belief that they carry the souls of the people they killed in the afterlife, not unlike the chains that bound Jacob Marley. This turned the episode into the sci-fi equivalent of something like A History of Violence, or even The Great Gatsby: Tales of men trying to escape from pasts that threaten to destroy them. It was about as meditative as Doctor Who gets, considering the barrelling pace and drive of any given episode, and even though it felt a little forced having Rory (a nurse) argue that Jex deserved to die, or suggesting that The Doctor would be so uncertain of a course of action given his usual aversion to violence, it still made for a very interesting episode from an intellectual standpoint. In the light of these ideas, the resolution felt a tad easy and neat, though not distressingly so. After an exciting sequence in which the townspeople and The Doctor mark themselves with facsimiles of the distinctive facial markings that indicate Jex's identity, then run around the town in order to distract The Gunslinger whilst Jex makes his escape, Jex's conscience finally catches up to him. Realising that The Gunslinger will just keep pursuing him, and that his continued existence will put more innocent lives at risks, Jex activates the self-destruct sequence on his ship (which The Doctor encountered earlier in the episode, so I guess this is a rare case of Chekhov's Self-Destruct Mechanism), killing himself in the process. Whilst this does resolve the central issue, it does so in a way which sidesteps the need for The Doctor to make a choice that would cause Jex or The Gunslinger to die as a result of his actions. It allows Jex a noble death, whilst also allowing the morally purer character to live and seek redemption by becoming the guardian angel of Mercy. It's all very nice, but still feels a touch deflating after seeing the show juggle some genuinely sticky ideas throughout the rest of the episode, and kind of makes the discussion of The Doctor's morality being a prison moot. It's strange that the light-hearted episode ended with The Doctor making a difficult choice, and the one that examined a moral quandary wrapped everything up in a neat little bow. That's the downside of the show's unpredictability, though they are inextricably linked with the accompanying highs. - Despite the fact that the episode was based around a fairly difficult situation, it was packed with some great lines. ("Tea. The strong stuff. Leave the bag in.") Toby Whithouse as a writer has sometimes struggled when it comes to plot, but he's second only to Steven Moffat when it comes to writing great, funny dialogue for the characters. - As someone who loves loves LOVES Farscape, I was delighted to see Ben Browder in this episode, even if only for a fairly brief time. He should be a way bigger star than he is; he's got charisma to burn. - The episode actually reminded me a lot of Farscape, albeit an episode set in a Western town rather than on Moya. That show often would create constantly shifting situations in which characters would initially seem to be good or evil, the slowly unpeel the layers to reveal their true nature, a trick this pulled off multiple times. - This was the first episode of the current season which basically could have been made without Rory or Amy being involved at all. Their roles in the story could have been filled by Isaac and A.N. Other Townsperson - Rory in particular had nothing to do - and they only real reference to their status within the world of the show came when Amy said that The Doctor's harder edge must be the result of him travelling on his own. Still, next week looks like it'll mark the true beginning of the end for The Ponds, as they realise they can't keep living both their Doctor and non-Doctor lives anymore.